Description: German made. M1.4 x 9.5mm steel suspension spring screw. Can be used on other clocks. 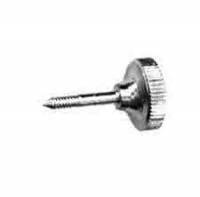 Description: Nickeled Hermle chain wheel lockwasher is a winding wheel retainer. 14mm OD x 4.7mm ID. 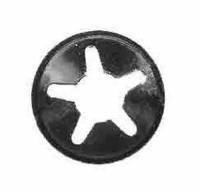 Description: 50 piece assortment of split tension washers (E-clips). Used on Hermle & other German clocks. Fits 3 different shaft sizes: M2, M3 & M4 (.0787", .118" and .155"). Steel phosphate plated. Description: Mounts movements in brackets. M3 diameter. Fits Hermle & other movements. 29mm overall length. With 22mm of thread. Description: Mounts movements in brackets. M3 diameter. Fits Hermle & other movements. 39mm overall length. With 32mm of thread. Description: Mounts movements in brackets. M3 diameter. Fits Hermle & other movements. 46mm overall length with 22mm of thread. Description: Mounts movements in brackets. M3 diameter. Fits Hermle & other movements. 61mm overall length with 32mm of thread. 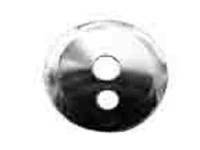 Hermle Movement Mounting Washer 5/8" x 2"
Description: Rectangular steel movement mounting washer for Hermle movements & others. 5/8" x 2". Made in Germany. Description: 13/16" round convex steel washer is used with movement mounting screws on Hermle movements & others. Made in Germany.